Okay, so how many of you actually remember CAMPFIRE TALES? It's a horror anthology movie, sort of along the same lines of TRICK 'R TREAT, but with an URBAN LEGEND spin. I remember being on a big slasher movie kick back in the late '90s (hell, I still am!) and spotting this movie at a video store. The cover art alone sold me. A thing of beauty, really. The movie was released direct-to-video in 1998, three days before URBAN LEGEND opened theatrically. It's obvious, judging by the cast and production value that this was probably originally intended for a theatrical release as well. But somewhere along the lines things got derailed. Same thing happened with SHRIEK IF YOU KNOW WHAT I DID LAST FRIDAY THE 13TH -- filmed before SCARY MOVIE, but released DTV after SCARY MOVIE. Either way, I scooped this bad boy up and raced home to throw it in the VCR. Actually, if memory serves, I was spending the night at a buddy's house -- and we watched this together, devouring every bit of terror that we could. The movie actually plays like an adult version of ARE YOU AFRAID OF THE DARK?...with a lot more blood and violence. A group of teens are stranded when their car breaks down in the middle of the night...in the middle of nowhere. So, naturally, they venture into the woods and start a small campfire. One thing leads to another -- and to pass time -- they start telling scary stories. It's basically everything you wanted to do when you were teenager, but never happened. 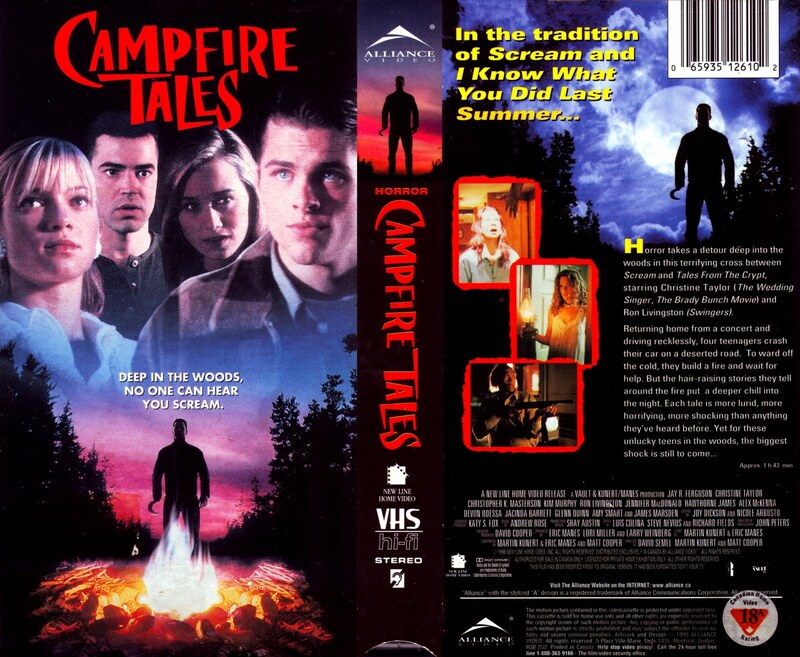 Is CAMPFIRE TALES a good movie? No. Is it a scary movie? It can be. Is it fun and entertaining? Hell yes! I recommend CF to any horror fan. You'll either love it or hate it. That's my stance. I love it. And I think you might, too. Check out the super-nineties trailer below! Even the production value of that trailer suggests a theatrical release was intended. And if you're super curious, the whole movie is available on YouTube, albeit with foreign subtitles (English audio).